Following the release of his debut album as Canon Blue, New Orleans-based Daniel James dropped a perfectly formed four-track EP in Rumraket’s stocking just before Christmas. 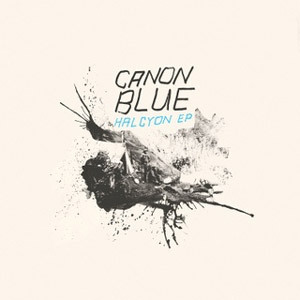 The EP, which is available to download for free from the Canon Blue Myspace and Rumraket sites (see below), features four brand new tracks, recorded in November 2007 in his bedroom, with a handful of friends lending a hand. Halcyon is, according to James, a celebration of winter, a period during which he feels particularly creative. Set in a similar style to James’s excellent Colonies album, the songs collected here denote however a gentle evolution in the way James assembles his pop songs and gives them a definite edge. The melodies appear more confident and refined, the soundscapes are increasingly cinematic and the vocal performances have gained in definition, yet the songs still have a subtle air of naivety about them. As the opening title track rises from initial processed guitar stutter and progressively swells into an intricately layered orchestral noise cloud before dying all too suddenly on a single note, James clearly reassess the space within his music by bringing forward real instrumentation and taming down his more technological side so it works in perfect symbiosis. Ennui, (French for boredom), shows a similar approach as a piano cascades down on a catchy melody which appears in turn uplifting or melancholic, while the firmly paced beat which seats in the background works as a tempered counterpoint to James’s vocals. Avatar Furr is a much more upbeat and pressing affair, but the melody ebbs and flows as the beat retires for a moment, leaving for a moment the orchestral drapes and swirling piano lines to lead. The highlight of this EP comes with the cinematic closing piece, Kingfisher Sweet, as James the singer steps back to leave James the musician sole at the helm of this ambitious miniature pop epic. With this excellent new EP, Daniel James refines his sound and steps up the pace from his debut album, revealing a much wider and evocative sound while retaining the very essence of Colonies. Not to be missed!